While walking through my neighborhood for exercise, I came across this little beauty (see picture to right). Within an old newspaper stand is a little free library. Chalkboard paint on the sides tells the story: "take a book, give a book, borrow a book, etc." I was star struck. What a lovely concept! And it's a concept that has been steadily gaining momentum. The original Little Free Library was a monument to a mother who passed away. She was a teacher who loved books. 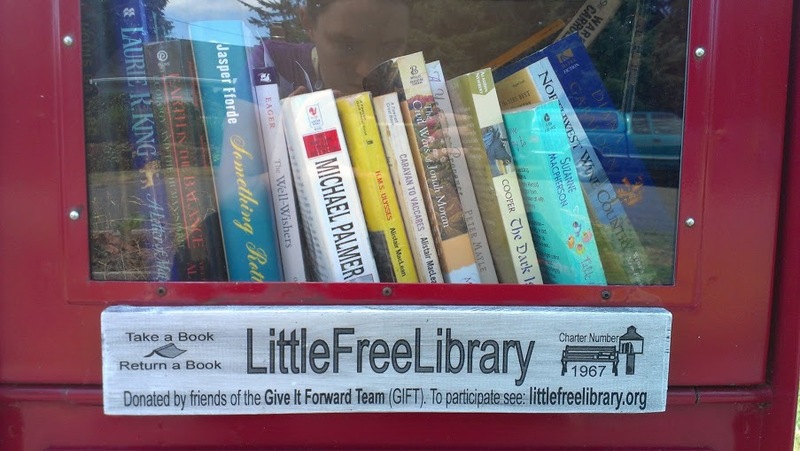 After people discovered the concept, Little Free Libraries have been cropping up all over the country. The founder now is working towards 2,510 Little Free Libraries around the world to beat Andrew Carnegie's library building record. I took a whole bunch of pictures of my neighborhoods Little Free Library and showed them off to my mother, a middle school language arts teacher. I knew this would strike a chord with her. She turned to me and said, "I want one in front of my house!" I guess I'll have to help her build one! The official website has plans for building your own and even sells kits. Check out their site for the goal of the Little Free Library and what it takes to be a librarian. Two key ideas for maintaining your own Little Free Library: 1) find a water resistant box to store books in (outdoors), 2) make sure the box is fully stocked with fun and exciting content. The idea is that the neighborhood pitches in with new books, but someone needs to be the care taker. Your Little Free Library can be themed by fiction genre (mystery, fantasy, sci-fi, classic literature, etc.) 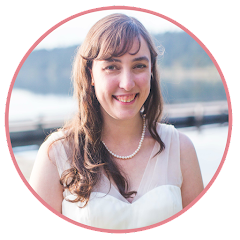 or it can be narrowed down to a specific non-fiction topic (politics, travel, crafting, etc.). As the care taker, you get to set the tone by putting the first books in and making sure it is always stocked with books. More of my photos of the Ravenna Little Free Library can be found on my Google Plus page. 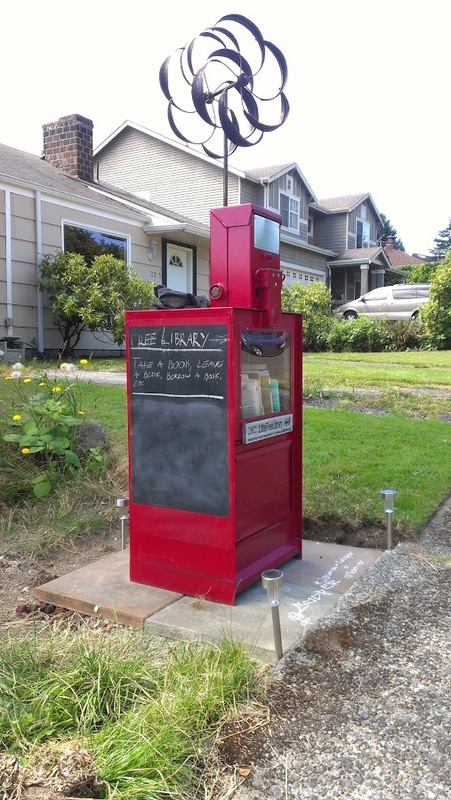 The Little Free Library in my neighborhood (Ravenna, Seattle, WA). Never mind my reflection! Slide Shows - get inspired! What a great idea! I love this concept. I love FLL..It's such a great concept and I think there needs to be one in every community! !